Graduation. It is a huge stepping stone no matter how many times you do it! I often have mix feelings about this. It’s such a proud and majestic moment but the future can sometimes seem so uncertain! 2 of my best friends Hambie and Tracy graduated on the same day! Too bad Tracy was at work and couldn’t make her convocation 😦 Hambie however flew from Toronto to attend this special day! 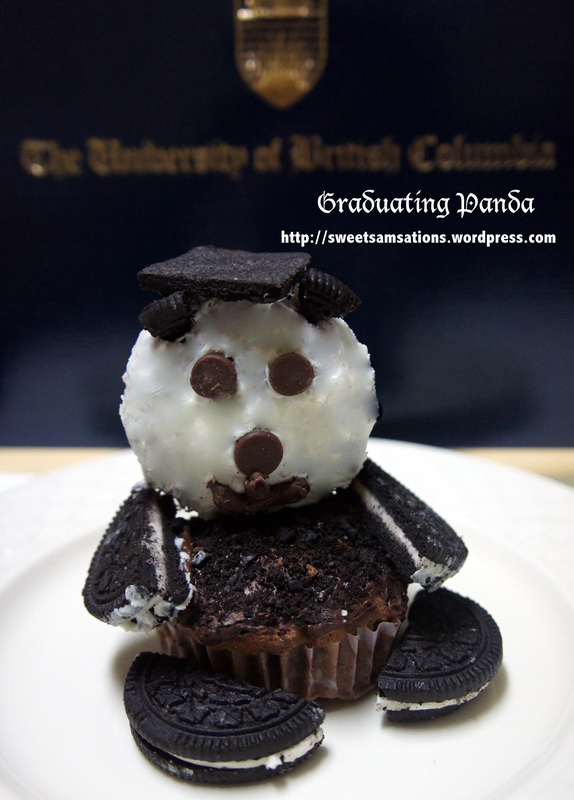 I know this means a lot to her and so I decided to make her a panda cupcake! I remember graduating last year. 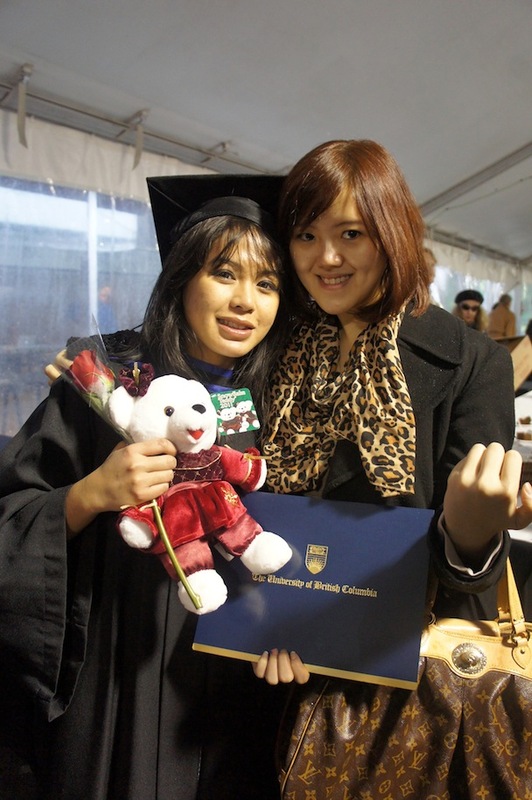 I couldn’t help feeling guilty somehow, because I knew I could have accomplished much more during my university years. I had the PGS (Post-Graduation Syndrome), all of a sudden, I didn’t have a goal! I wasn’t bombarded with unending essays and exams! I was FREE, too free… But it was post graduation that I discovered 2 of my passions. You guessed it, Baking and Hot Yoga! Does the recipe look familiar? Well, remember how I mentioned in my previous post that the portion for the Kit-Kat Cake’s frosting was overly generous? Yes, I only used 1/4 of it. The frosting recipe (in blue) was adapted from The New Southern Cook by John Martin Taylor. The ingredients specified on top would make 12 cupcakes. I didn’t want to waste the remaining 3/4 of the recipe and thus decided to add 3/4 cups flour, 1/2 tsp baking powder, 1/2 tsp baking soda, 1/4 tsp salt, 2 tbsp water into the mixture and PRESTO! Yes, I know. It was definitely quite random! But they turned out delicious! 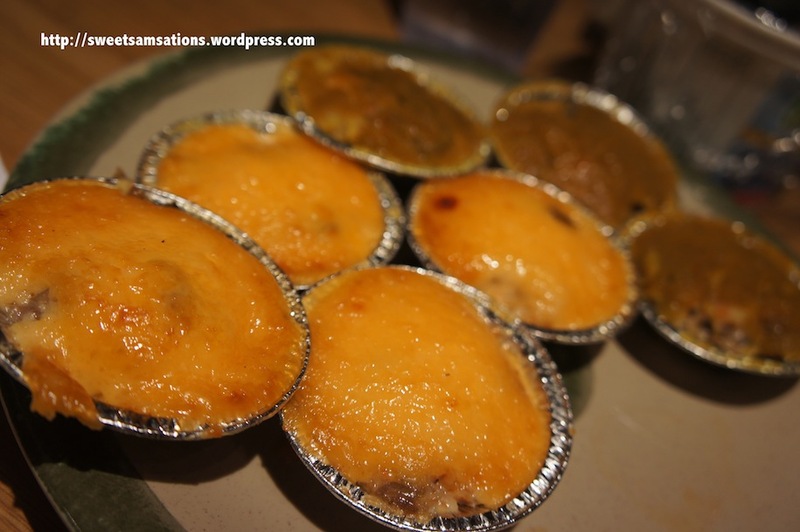 I myself had 3 of them as soon as they were out of the oven. Hambie said she and her brother enjoyed them very much too! 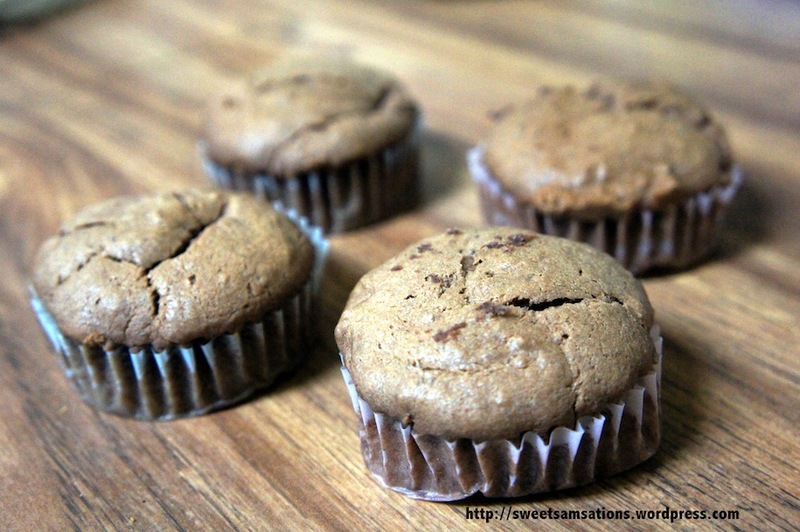 They were soft and moist and the bananas in them made my kitchen smell absolutely lovely! As for the pandas, I was inspired by Hello, Cupcake!‘s “Pandamonium Project”. Strangely enough, Hambie’s company’s name is called Pandamonium Productions! I am submitting my post to Aspiring Bakers #13: Enjoy Cupcakes! 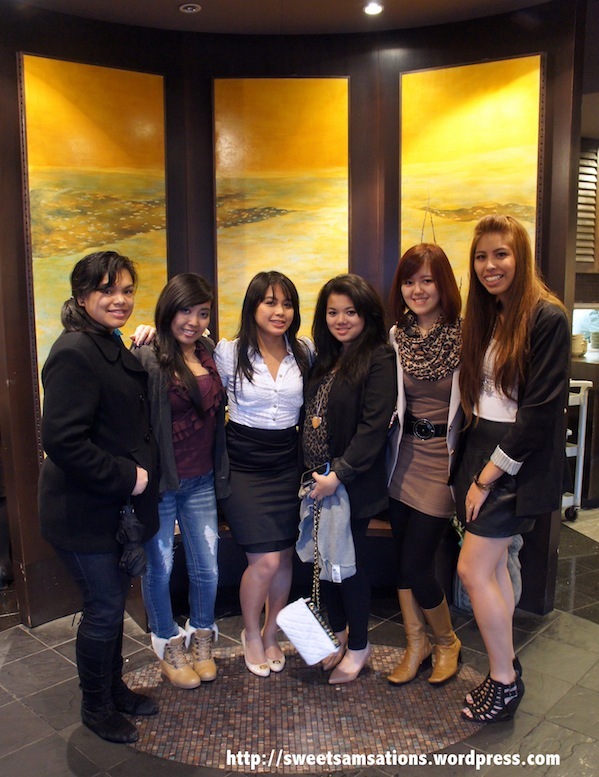 (November 2011) hosted by Min of Min’s Blog. 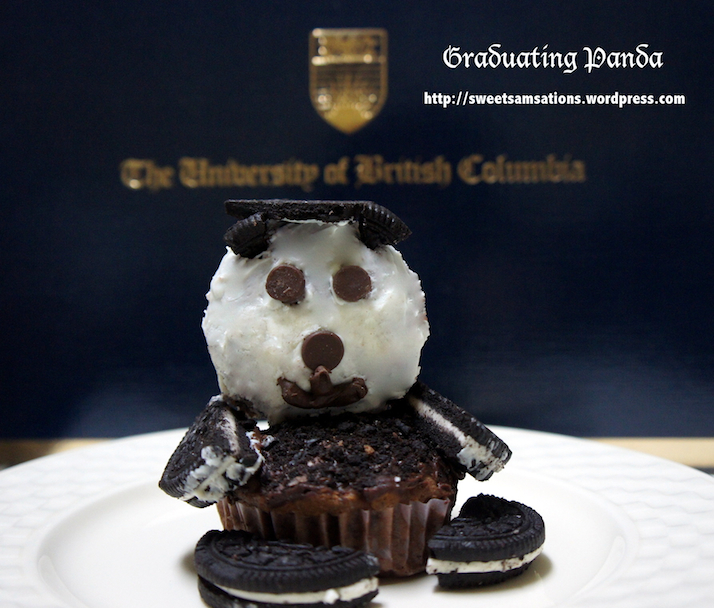 You will need 2 cupcakes for one panda. Frost the body with a chocolate frosting and sprinkle with Oreo crumbs. Frost the head with vanilla frosting. You may also include some of the cream from the Oreo to frost. For its eyes and nose, I used chocolate chips. I melted some in a plastic bag to frost its mouth too. For its ears, break of a small triangle from an Oreo cookie. 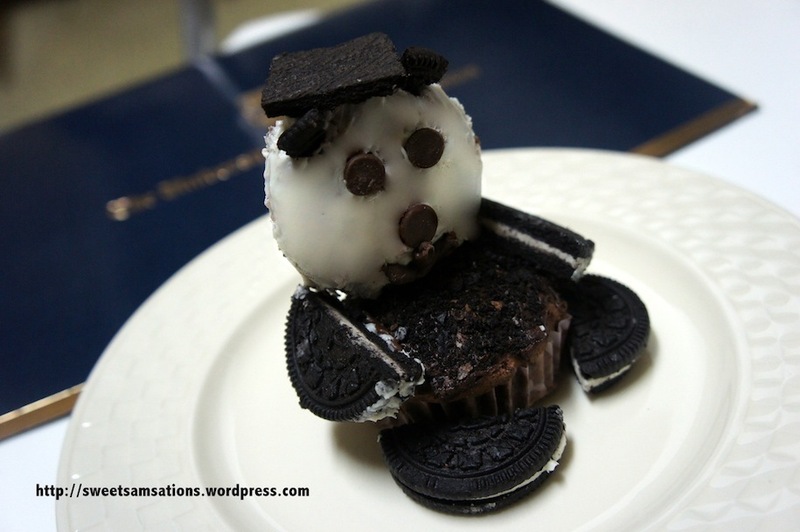 For the graduation hat, use a sharp knife to cut out a square from an Oreo cookie. Use melted chocolate to glue it to the top of its head. 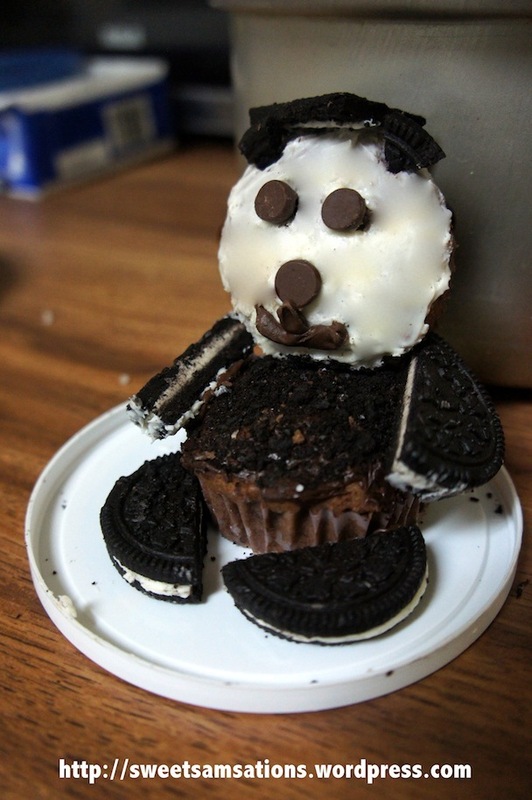 Cut 2 Oreo sandwiches in half to form its arms and legs and use melted chocolate as a glue to its body. 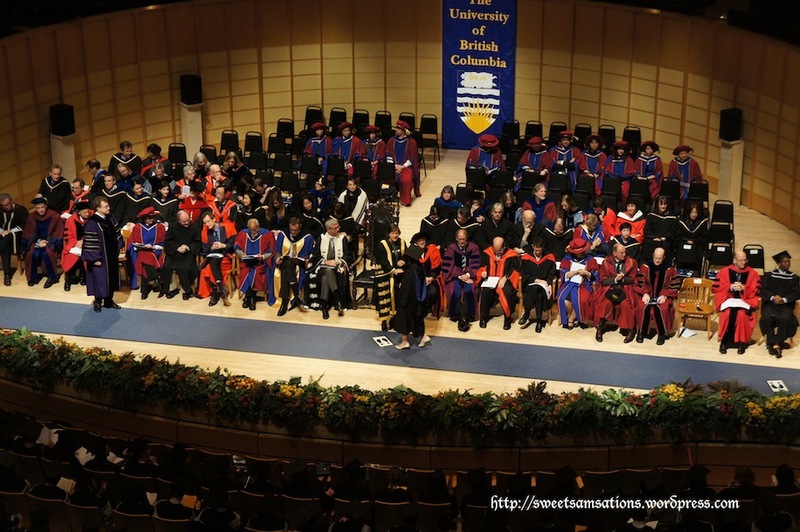 Hambie’s grad took place at the Chan Centre at UBC, just like all the other UBC graduations. This hall is interestingly shaped like a cello! Uncanny!!! 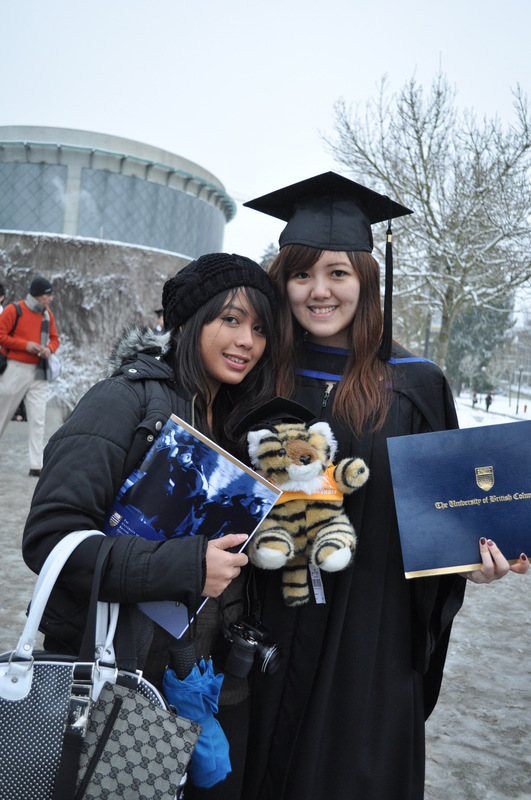 We both had our Degrees and a plush toy in our pictures. 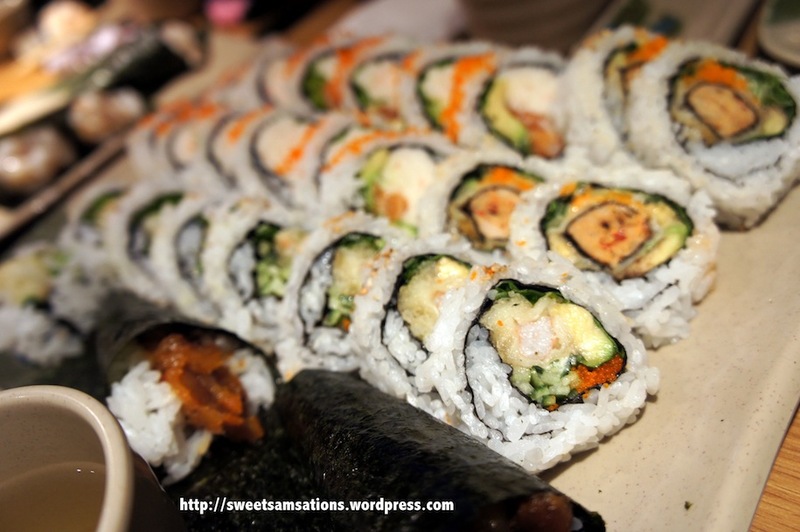 We got pretty hungry later and decided to go for ALL YOU CAN EAT SUSHI at Tomokazu Japanese Restaurant. 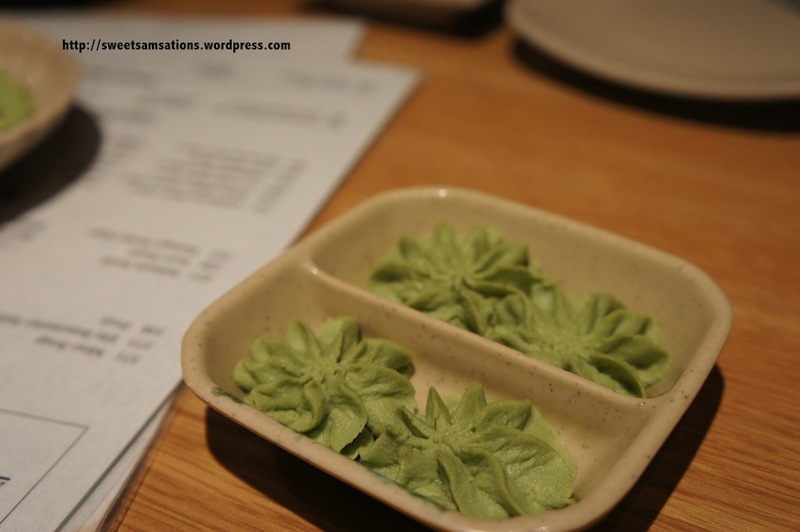 I must say, I’ve never seen Wasabi being piped before! I’ve worked in 2 sushi restaurants during my university years and we’ve always had them rolled it into lumps of balls. But yes, quite innovative. First time trying the Portuguese Seafood Motoyaki. Very yummy! ← Have a Break, Have a Kit Kat Cake! lol! That’s still a while! One more year and it will be your turn babehh!! 😀 They’ll actually give you the grad hat if you attend your convocation! I LOVE IT BABEBABES!!!! AHHH thank youuu again ❤ aingggg. Just read the whole thing. 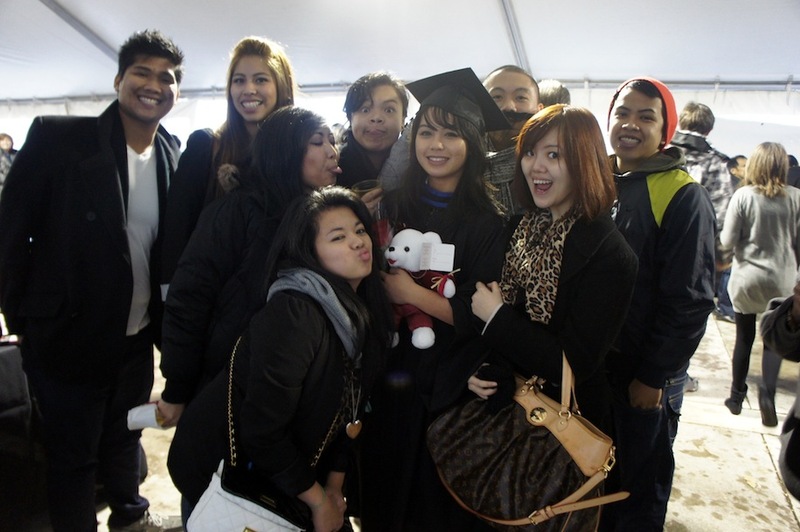 And omg our pose in our pics from both our graduations look THE SAME except for who's wearing the hat, hahaha. Noticed that! PS and YES, pandas do say "aing." It cannot possibly be anything else. haha.. that’s right babes! You are very welcome! I’m glad I finally got the chance to let you try my baking! Awww, the panda is so cute! Your friend is very lucky to have you as a friend!